From spotless carpets to sparkling facilities, our team of cleaners have been busy keeping the businesses of South Wales in pristine condition for over 30 years. Our family-run cleaning business offers a professional, flexible and affordable cleaning service to the companies of Cardiff and the surrounding area. We owe our longevity to that all-important extra: the personal touch. At The Abbey Cleaning Service, we work closely with our clients to ensure that we’re offering cleaning services that meet their needs and fit with their schedules on an on-going basis. We know that what works one week may need to change the next. That’s why we’re happy to be flexible, fitting into your schedule while our highly trained cleaners do what they do best – to ensure that your professional space is comfortable, clean and creating the right first impression. 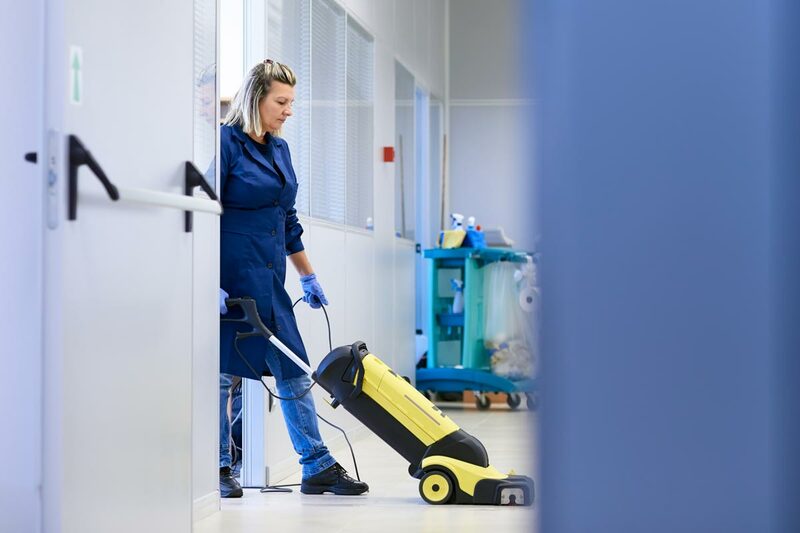 Spotless cleaning – We train every one of our cleaning staff to carry out every task to the highest possible standard, all to make sure that your professional space is perfectly pristine. Dependability – Whether you’ve booked our team for a one-off job or have a regular cleaning schedule, our cleaning staff arrive on time, every time, come rain or shine. An “extra mile” cleaning service – We do more than just hoover and polish… We’re always looking for fresh ways to offer quality cleaning and extra convenience. With no job too small, you only have to ask. We may offer an “above and beyond” cleaning service, but that doesn’t mean that we charge “out-of-this-world” rates. In fact, we’re proud to offer top quality commercial cleaning in South Wales at a very competitive price. You can find out more about our fees by requesting a quote from our helpful team. Every particular of your cleaning requirements is considered when we calculate your rate – from insurance and admin to labour costs and cleaning materials. This means that your cleaning quote will be fully-representative, with absolutely no little extras added on later. We can even offer consumable office essentials such as hand towels and toilet roll to you at cost price, just to provide even better value. No two businesses are alike. Every company has its own schedule, its own equipment, and its own pet peeves. We train our team of cleaners to service your professional space to your precise specifications, to make sure that you receive a perfect cleaning service that is tailored to your business. Step one of this processes involves meeting with you at your premises to walk through your requirements. We get to know your time-frame, your safety procedures, your layout and your equipment. We then work with you to build an cleaning regime that suits your business down to the ground. After we have worked with you to design your ideal cleaning service, we arrange a convenient time to bring our team of cleaners on site to start step two: training our team to deliver a flawless service, designed around your needs, preferences and premises. We don’t rest on our laurels. We’re passionate about delivering the highest standard of hygiene and cleanliness in the South Wales area. Therefore we do everything we can to ensure that our cleaners are delivering a consistently immaculate service. Our management staff regularly drop in to undertake pre-arranged spot checks, consistently monitoring and improving the performance of our staff at your site. Your feedback is as crucial as our spot checks. While we work hard to maintain our high standards of cleaning, we also listen to you closely, implementing new practices and using your insights to constantly improve how we clean. We may consider ourselves to be South Wales’ cleaning experts, but we think that it’s crucial to never stop learning from our clients. Take a look at our testimonials page to see more and in order to get an inside view of our cleaning services from the people who really matter: our clients. Keep your company spick-and-span with commercial cleaning services from The Abbey Cleaning Service in Cardiff, South Wales. From spot checks to extra sparkle, we ensure that your professional space is clean, comfortable and always makes the best first impression. Use our enquiry form or call us on 029 2067 9323 to discuss your needs today.